Thank you to Janet Mata for the following research. Henry Alexander Potter was born in Sutton, Surrey, the first child of Alexander Henry and Bertha Sarah Potter. Alexander and Bertha Potter were married in Sutton in 1886 and Henry was born on the 7th September 1887. He was baptised in the same church in which his parents had married. Alexander, who was a watchmaker by profession, and Bertha had five more children: Alice, Victor, Raymond, Gwendoline and Alec. The 1881 census shows the family were in Sutton, and by 1891 they were living in Epsom. In 1901 the census reveals that the family were living in Clare, Suffolk, and in 1911, Bertha and Alexander and their two youngest children had returned to Surrey and were living at 6 Howard Road in Dorking. Harry Potter joined the Royal Navy on his 18th birthday, 7th September 1905. 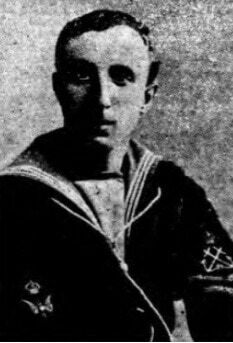 His service record tells us that before joining the Navy, he was a draper’s assistant, although Harry’s obituary in the Dorking Advertiser says he worked for the jeweller E.J. Hubbard, Dorking High Street. In the Navy, he served as a Petty Officer Telegraphist. He is described on his service record as being 5ft 9ins tall, with auburn hair, brown eyes, a fresh complexion, scarred knees; he had a mole and a freckled right arm. At the time of the 1911 census Harry, now 23 was serving aboard HMS Highflyer while it was in China and the East Indies. His naval service shows that he served aboard numerous ships, his first ship being HMS Impregnable. He was awarded the Naval General Service Medal Medal during his service in the Persian Gulf. He was serving aboard HMS Invincible, a battle cruiser, when it was involved in the Battle of Jutland on 31st May 1916. The Invincible was hit by a German shell, which caused a massive explosion and split the ship in half. It sank immediately with only six survivors from its crew of over one thousand. Harry Potter’s name is recorded on the Dorking War Memorial, and also on the War Memorial at Chatham.